Huge Savings Item! Free Shipping Included! Save 18% on the Rainshow'r PFGG Prefiltration Filter for GardnGro by Rainshow'r at Friv 4 Friv . MPN: RAINSHOWR-PFGG. Hurry! Limited time offer. Offer valid only while supplies last. PFGG Features: -Make your Gard'n Gro more effective with the Rainshow'r Pre-Filter. -Filters out sediment up to 5 times smaller than a human hair. PFGG Features: -Make your Gard'n Gro more effective with the Rainshow'r Pre-Filter. -Filters out sediment up to 5 times smaller than a human hair. -Comes with their new three foot, high pressure , nylon re-inforced, flexible, vinyl hose saver. -Fitted with brass, 0.75" fittings. -Hose saver connects the garden faucet to the hose saver inlet to prevent pre-filter damage from hose whipping. 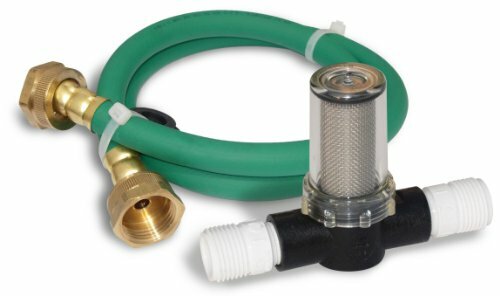 -Same quality hose saver that comes standard with every Gard'n Gro and Green Knight Filter. Product Type: -Garden Pre-Filter. Finish: -Black and White. Country of Manufacture: -United States. Dimensions: Overall Height - Top to Bottom: -3.75". Overall Width - Side to Side: -5.5". Overall Depth - Front to Back: -1.75". Overall Product Weight: -1.1 lbs.